Excluding bats from your building! Did you know that if you find bats in you attic you do not need to kill them. There are ways to exclude bats that allow the bats to find other roosts. In our neighborhoods, Big Brown, and Little Brown bats are the most likely to be your mysterious, and harmless renters. A positive affect of humans on bat populations is the addition of street-lights that tend to concentrate insects, namely moths. It is important not to disturb bats when they are roosting or hibernating. The following provides an overview of bats in buildings and dealing with unwanted roosts. By necessity, these comments are general and specific circumstances may vary. 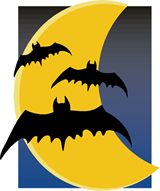 Timing is absolutely crucial in dealing with unwanted bat roosts. Following the guidelines outlined below at the wrong time of year will often result in unnecessarily creating more problems for the roost owner. First, a bit about bats. Bats are not rodents. They do not make holes in buildings, they do not enlarge holes in buildings, they do not chew wiring, and they do not build nests. They use the structure just as they find it. It is however not accurate to say they do not damage structures. 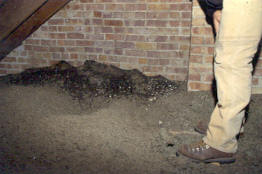 A large roost, over time, can result in damage of building materials by deposition of urine. The urine has a very pungent odor, particularly noticeable during warm temperatures. Removal of this odor can be difficult without replacement of the affected building materials. The point here is not to be concerned about rodent-like damage to the structure. The same bats will use the same roosts from year to year. If you have bats this year, it is likely they will be back next year unless they are excluded from the building. Exclusion is the best way of dealing with the problem of unwanted bats in buildings. Exclusion is a process by which bats are sealed out of a structure. certain guidelines. Failure to do so may inadvertently create more problems. Poisoning bats is illegal as well as irresponsible. Attempts at poisoning seldom kill all of the bats and you end up with sickened bats flying out, becoming grounded, and being retrieved by area children and pets. Additionally, it does nothing to address the bats gaining access to the structure in the first place. As bats are mammals, anything harmful to them will also be harmful to you or to pets. In South Dakota, collectives (groups) of bats in buildings are typically maternity/nursery roosts. Numbers of bats in such roosts varies and can range from less than ten to over a thousand. 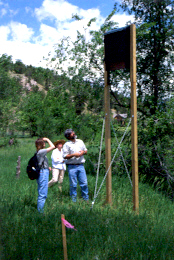 Typical roost size in South Dakota is 20-30 bats. Bats differ from most other small mammals in that they give birth only once a year and generally only to a single pup. Adult females come together in the early spring to give birth and raise their pups. It is important to recognize that these roosts can form from wider areas with reproductive females sometimes traveling great distances to derive the benefits of collective roosting. As such, coupled with the low reproductive rate of bats, destroying such roosts can have much wider implications affecting the success of the species. Exclusions must be timed to be completed before the females have given birth or postponed until after the pups have had sufficient time to learn to fly. Optimal exclusion dates will vary depending on a year's weather conditions. In general, exclusions in SD should not be conducted between mid-May and September 1. Most bats found in buildings are seasonal visitors; arriving in the spring and departing in the late summer or early fall. Bat species that roost collectively in buildings must hibernate during the winter, as there is no insect prey available. Buildings typically do not provide the necessary conditions bats require to successfully get through the winter. As cold weather approaches, they begin to move out of their summer roost and head for their hibernation sites (or to warmer climates farther south). 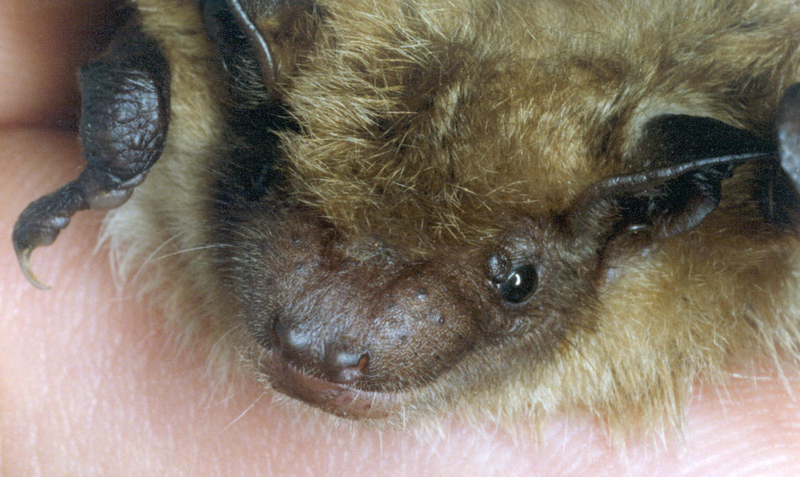 By the time cold weather arrives, nearly all of the bats will have moved out of buildings. The ideal time to do exclusions is either after the bats have left for the winter or early in the spring before their arrival. If you have read the important preceding information and have decided to evict your bat tenants, here is the method to use when bats are (or maybe) in residence. The following should only be used in roosts of fewer than 100 bats. For large roosts, contact an experienced bat exclusion specialist for advice. 1) First step is to identify the bats favorite point of entry (there may be more than one). If there is more than one point of access but you are certain they are connected within the structure (different openings leading into the same soffit for example) you may proceed with the following directions. If you are uncertain the sites are connected or they are in different parts of the structure, each roost should be treated separately. Identifying the entry point is usually not too difficult. 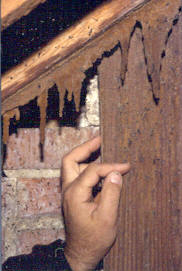 Bat droppings may accumulate beneath the access points or a dark staining can sometimes be seen around access points located in light colored materials. If you have no idea whatsoever where they are coming into the structure, position yourself and some friends around the outside of the house at dusk to watch for the bat's nightly emergence. This should be done on a warm, calm evening. Cool temperatures or rain will usually delay or prevent emergence of bats. Once you have identified the entry point, you should (during daylight hours) thoroughly examine the structure and identify any openings other than the one you have identified as the main point of entry. This is probably the single most important step in the entire procedure. Many openings may not be visible from a vantage point of standing at ground level. This is particularly true for multi-story structures. Use binoculars or examine the structure from a ladder. All openings EXCEPT the bat's entry point should be sealed. Many people believe bats to be larger than they are thereby requiring large holes to gain access. While some species are smaller than others, it is generally recommended to fill anything larger than one-half inch. 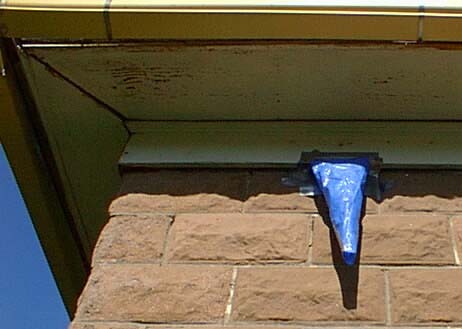 (Smaller species have been known to utilize the trough in the pointing between the ends of two bricks to pass under the fascia board and gain access to the soffit.) Sealing openings is easily accomplished using a good quality caulk for smaller holes or crevices and expanding aerosol foam for larger openings. Remember: bats are not rodents; they do not make or enlarge holes. If there are vents at ends of the building, check carefully to be sure they are screened. Even if vents appear to be screened, check for unfastened corners or holes that may be difficult to see from a cursory examination. Around flashing is also another easily missed access point. If possible, get into the attic with the lights off (during daylight hours) and note places where you can see daylight. The single most common bat entry point in western South Dakota is small gaps between an exterior chimney and where it adjoins the house. If this is your situation, fill all gaps on both sides of the chimney except for a single two-inch gap at the point where you've seen the bats enter or emerge. When you are finished sealing all potential entry points, the only way into the structure should be the identified bat access. Over this final opening, you will temporarily install what amounts to a one-way escape vent or chute. This vent is fashioned from heavy mil plastic or poly tarp material. It should be approximately 24 inches in overall length and shaped as a cone (similar to a windsock). Duct tape works well to hold the cone together (put the tape on the exterior of the cone so that the interior remains smooth). The large end of the cone should be large enough to cover the opening the bats have been using plus a couple of inches surrounding the opening. The small end of the cone should have a hole whose diameter is about the size of your thumb. Attach the large end of the cone over this last opening in the structure making sure to completely seal all the way around the cone. The bats must not be able to emerge anywhere except out the small end of the funnel. Again, duct tape works well for the purpose of attaching the vent. The cone should hang away from the side of the house and not lie flat against the structure (that's the reason for using something heavier like the poly-tarp). This vent should be left in place for 5 to 7 nights of good weather. This gives all bats the opportunity to get out. They can emerge but cannot get back into the building. At the end of this time, remove the cone and immediately seal this final opening. If you have not missed any other openings, you have solved your bat problem. REMEMBER: Simply blocking the bats' access holes without first treating the entire structure will usually result in the bats finding an alternate entry point. If done at the wrong time of year (see above for acceptable dates), you may simply exclude the adult females entrapping juveniles not yet able to fly. This generally results in more determination on the part of the adult females to find another way to get back to their pups that can often result in bats gaining access to the human living space. In addition, when the mother does not return, the juveniles begin to search for mom and often end up crawling into the human living space. A NOTE OF CAUTION: Be forewarned that any activity on a ladder at any openings in the structure may startle an unseen roosting bat into flight. Try not to work immediately in front of or directly beneath an access point. Such a surprise can easily result in a fall off a ladder. Where possible, place your ladder to one side of your work area. 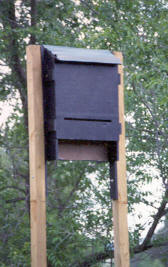 You should also consider erecting an alternative roost location for your newly evicted bats. The design and placement should be appropriate for the roost size and species. It is best to have this roosting alternative in place well before the exclusion is performed. Properly timed exclusion of unwanted bats from roosts, providing appropriate roosting alternatives (where applicable) is a workable, responsible method for dealing with bat-related problems. Minimizing contact with humans and pets should be the goal of any control program, but this need not be done at the expense of the bats. Their contribution to a healthy ecosystem as the main predators of night-flying insects (many of which are forestry and agricultural pests) far outweighs any associated risks.